Hi Everyone! I wrote this website because I wanted to share my musings on being an “Everywoman” and how to do it all. Or, at the very least try. I love mixing “the real with the fantastic,” and like nothing better than taking different scenarios and creating worlds where things just aren’t what they appear to be. My 4-book Buddhist thriller series, THE HUNT FOR XANADU, THE QUEST OF THE EMPTY TOMB, THE CALL OF MOUNT SUMERU and THE HAUNTING OF CRAGG HILL HOUSE, are about a brilliant and fearless young woman named Kelsey Porter, whose life is steeped in Buddhist spiritual mysteries and she is constantly discovering the world around her is not what she believed it to be. Please feel free to check it out here at this link. My Dark Fantasy Series, THE WORLD OF KAROV and THE RUBY AMULET take us to other realms filled with magic and evil as a dark presence is seeping through the dimensions. I always thought there should be more special needs characters in mainstream books. My YA novels, FLYING TO THE LIGHT and FLYING TO THE FIRE are about a young deaf boy who knows what happens to you when you die and now people are after him for the answers. 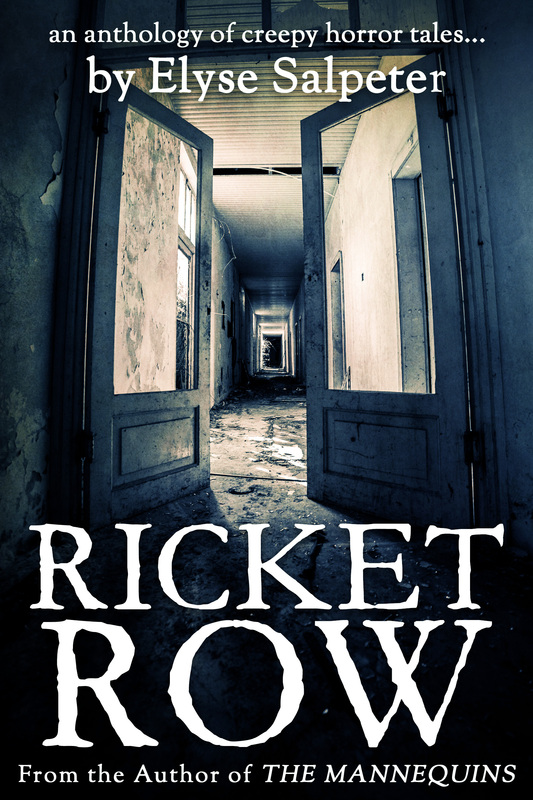 Lastly, my horror novel, THE MANNEQUINS, is about a film crew that enters an abandoned mansion and disappears, while my horror anthology, RICKET ROW, is filled with little creepy tales, guaranteed to keep you up at night. When I’m not writing, I’m cooking, jogging, running around with my twins and eating shock food in my Gastronaut Club. Come, let’s chat! Good post Elyse! I look forward to reading more. Tell your ferret I said hello! Love the blog Lyse. I was totally impressed seeing your name as an author on Amazon. The book kept my interest and was very easy reading. Awaiting your next novel. I guess I am a bit of everything myself. Teacher,gardener,mom, grandma and caregiver to many. My main worry right now is my oldest Shepard-who is over 9 years old and failing fast. Had 3 major traumas in the past 18 months including a life saving surgery for her stomach turning. When do you call it over for a dog you have had for more than 9 years? She cannot eat without having it come out one of 2 ways. Really OK for the carpet cleaners-but not for my in house family that includes an 18 month old granddaughter. Such a difficult decision. Anyway-always good to talk at you cousin!!!! Ok Elyse I get my Kindle tomorrow is there a way to download the book from Amazon yet? Wow, I’m honored and would love to do this with you… looked at the link – do you personally ask me questions? My list of questions for my nominees is at the end of my post. Let me know if you can’t see them?